Any 1 guide me by replying best way of using the Money Drawing sachet powders? Hi everyone. I am wondering how to best use this powder. I want to draw money to myself so I can take care of a little debt that I've accumulated--nothing major, just something that I would definitely like to take care of. Should I just dress my wallet while praying Psalm 23? Dress your money, your wallet, your checkbook, your purse, and yourself with the powder. You can also mix the powder in with your regular foot powder so that you dress your shoes every time you use it. You can also line your doorway with it, and use a broom to sweep it in and onto your floor, praying that money and wealth come your way. I recently got a second job at a burrito joint here in Athens, GA. I start on Monday. The place has a tip jar, and tips are evenly distributed between the employees who are working during a given shift. I was wondering if it might be a good idea to sprinkle some money-drawing powder in the tip jar to increase the amount of tips, or if there is another powder or combination of powders that might be better suited for this purpose? Yes! That's a wonderful idea!!!!! Good luck and hoping that you make a fortune! Everything I have learned about Hoodoo has come from reading what Miss Cat has written online and from her book Hoodoo Herb and Root Magic: A Materia Magica of African-American Conjure which I highly recommend! The above ideas that I tried with the Money Drawing oils and sachet powders that worked for me came from Miss Cat's writing or from reading online here at Lucky Mojo as well. I have never had spiritual supplies that worked for me as well as Lucky Mojo's has. Truly great products! Oh yes! Another positive testament to Money Drawing Sachet Powders. Started to run short of funds to get through the month around the 15th so very prayerfully swept some Lucky Mojo Money Drawing Sachet in the front door, left it to God. Was pretty worried about the electric bill so I finally called the electric company because I hadn't yet gotten a bill for this month and was told I had a CREDIT and they owe me! So very cool!!! Thank you Lucky Mojo!!! Thank you so much for sharing your good fortune stories with us! So happy that you're happy! 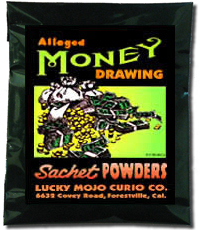 I know this is an older thread, but I have a question that I hope folks who regularly use the Money Drawing powder can answer. Does anyone ever have a problem with ants if they sweep this into their house during the warm weather (when ants abound)? We're having a particularly nasty year for sugar ants here in the Pacific Northwest, and I'd like to use the powder on my doorstep and entryway, but am worried about sweetness drawing ants in as well as money . Has anyone ever had that issue? The Money Drawing Powder Sachet Powder is not inherently sweet in and of itself, but if mixed with Cinnamon and sugar, as is often done, the mixture may indeed draw ants. Ah, that makes sense. I had it in my head that powdered sugar may be part of the mix. Thank you so much, Miss cat! I bought this powder in 2015 and just started using it again thsee past two weeks. Today, I got a notice in the mail of an unclaimed check for me from 2014 for $110! Blew me away! As always, thank you for creating such an excellent product and sharing it with all of us! Hello everyone I hope you are all blessed this beautiful Friday. I just received my order of Money Sachet Powder this week and I put some under the mat at our front door of the shop I work at and said a prayer, there was no sugar here to add to it but I also rubbed my hands in the Money Oil before pouring the powder in my hand. I hope this is sufficient enough to draw in the money and clientele I'm looking for. I do have a question, since I'm a hairdresser and I use a talc powder on my clients (mostly men) everyday, would it be a good ideal to go ahead and add some of the powder to my talc for some extra boots? I would say as long as you've checked on the health concerns with handling talc powder then I suppose it would be MAGICALLY appropriate to do so. I imagine that you are aware of reports indicating that talc powder has proven to be a cause of ovarian cancer in women, which I surmise is the reason you say you mostly use it with male clients of yours. I would suggest that you conduct more research on the effects it may or may not have on men before deciding definitively whether or not you should use it on client period. If you find that it is ultimately safe to use for me, then I reiterate, I think that is magically appropriate to use in such a manner. Good luck and stay safe. You are correct there are some health concerns over the use of talc and I'm fully aware of all the risk, trust I have looked for other alternatives but it just seems to be the only thing that helps remove the tiny hairs stuck on my clients necks =( . I usually hold my breath when I'm dusting it on clients and ask they do the same but it's kinda hard to avoid since everyone in my shop uses it. I almost never use it on a female client unless I absolutely have to. The thought just came to mind since it's something I use while working and I can be very discrete about it. Tomorrow I'm going to add a lil bit of the Money Sachet Powder to it and say a prayer and hopefully see results. I rubbed my equipment with Money Oil and anointed myself with Cleo May Oil and I did notice that all my clients were male today and were generous with the tips so I'm super pleased so far with these results. Thank you again for your help and advice. Try adding a bit of wealthy way and steady work as well. That should boost things along greatly.